Choosing a countertop is a big deal. You’re gonna be living with it for a long time, so you need to get it right. There are often tradeoffs in the choices. One may have a dynamic appearance, but needs extensive maintenance. Another may be in your price range, but easily scratches. 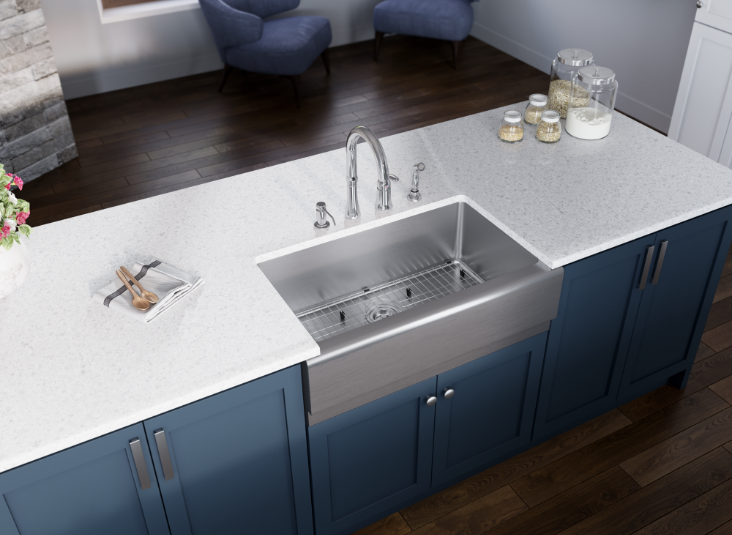 To help you decide what fits your needs best, let’s review a few key facts about each of the seven top-selling countertop materials. Granite commands a presence in any kitchen. It’s solid, bold, and beautiful. That’s why it’s so popular. And don’t worry, it won’t be scratched when cutting vegetables, nor scorched by that hot fry pan. However, it’s porous in its natural state, so every so often it’ll need a sealant applied to prevent any staining. Tile is a traditional choice. There’s no denying its clean, classic appeal. Heat, stains, scratches, and even moisture shouldn’t hurt tile. Still, the uneven surface can be irritating. Those grout lines tend to stain and gather mildew, but an occasional scrub should take care of it. Solid Surface is a blend of acrylic and polyester. People like the wide variety of patterns available. Since they’re non-porous, they resist stains, are easily cleaned, and never need sealing. However, you will have to be careful with your hot pots and sharp knives. Quartz and composite granite countertops are as tough as they come. Composed of ground quartz/granite and an acrylic binder, their density prevents scorching, staining, and scratching. The stone pattern and color choices are extensive and recent styles are even duplicating those intriguing veins in natural stone. It can be pricey, though. Laminated countertops have seen a resurgence since new manufacturing techniques began producing more interesting styles. They’re still durable and inexpensive, but keep in mind that their particle board core will only allow topmount sinks to be installed in them. Stainless steel countertops are perfect for restaurants and busy kitchens. They’re non-porous, antibacterial, stain, and heat-resistant. But in the home, they can also be loud. If you’re after the industrial look, and don’t mind the noise, this is it. Wood is always attractive no matter where it appears in the kitchen. When it’s used as a countertop, you gain a cutting surface at any turn. Even knife and scuff marks add their own worn charm over time. Only a periodic oiling is needed to refresh the surface. Once you’ve picked the material that best suits your needs, it’s on to choosing the right color and pattern that’ll complement the rest of your kitchen. Then it’s time to install.